If there were a place where the written word was priceless, where a painting or a sculpture was worth more than diamonds and where a song could inspire a love that lasts for centuries, would you go there? If there existed a city where genius and beauty were one and the same, where invention and ambition were prized above martial skill and where dragons and mortals lived together in eternal harmony, would you visit there? If there existed a city where magic in service to beauty was the highest ideal and where illusions revealed the greatest truths, would you live there? And if you came to such a place, could you ever leave again? 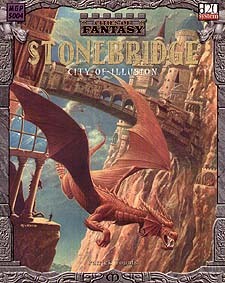 Stonebridge is a city like no other, an oasis of renaissance culture, home to art obsessed copper dragons and an impassioned race of gnomes whos blood sings with the twin fires of magic and dragon spirit. Stonebridge is home to the greatest geniuses of the age, men and women who have seized greateness and embraced innovation, who have slipped the boundaries of conventional thought for the endless vistas of imagination.